You always have an advantage when you know how to maximize opportunities to promote your business. However, most of the time, it ends up being a numbers game, and it’s a game not all small companies have the resources to play for long. Fortunately, our business card magnets wholesale offer allows you to print up to 5,000 copies at very competitive prices! As far as value for money goes, we’re not joking when we say we hit the sweet spot! 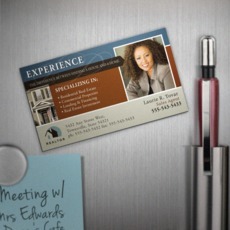 Our business card magnets are printed on durable 17pt. stock with UV finish, to ensure your prints will last a very, very long time! Call 1-888-888-4211, or contact our chat support team on the top of this page. Explore our site for business card magnet printing prices, design, promos, and much more!